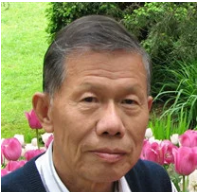 Westborough – Delin Miao, 86, of Westborough, passed away peacefully with his family at his side March 18, 2019 at UMass Memorial Medical Center in Worcester. Delin’s wife of 59 years, Jiying Zhang, predeceased him in February 2019. He is survived by his son, Xi Miao and his wife Li Cen of Colorado, and his daughter, Yi Miao and her husband Ning Zhong of Westborough. He is survived by his four grandchildren, Raymond Miao, Howie Miao, Denise Zhong and Jeromy Zhong. Delin Miao was born in Shanghai, China to Jiying Miao and Zhikun Gu on Nov. 16, 1932. Delin graduated from Shanghai High School, and from Huazhong University of Science and Technology, receiving a degree in dynamic engineering. After graduation, he worked as Professor for the same university for 23 years and then joined Guangzhou Institute of Energy Conversion as a researcher. Relatives and friends are respectfully invited to attend visiting hours Saturday, March 23, from 9-10 a.m., at the Chiampa Funeral Home ~ The Sumner House, 5 Church Road, Shrewsbury Center, followed by a funeral service at 10 a.m. in the funeral home.